The CSI Effect is thought to be caused by pre-conceived notions that jurors have prior to serving in the courtroom, based on what they have seen on television. It comes as no surprise considering that courtroom television shows are viewed by well over 100 million viewers! Primetime courtroom dramas are packed with high-tech, state-of-the-art, even futuristic equipment and forensic testing that viewers equate with how trials should be in real life. When jurors enter the courtroom and find otherwise, they are disappointed with the lack of high-tech equipment and how evidence is presented. If the CSI Effect truly exists, there are both positive and negative consequences for attorneys, judges and Law Enforcement to be aware of. It raises the bar for police officers, investigators and prosecutors. Truth is the standard, but how facts are found, and presenting them effectively using today’s benchmark technologies is the ultimate path to guilt or innocence. The general public gains a greater understanding of science, technology, forensics and courtroom proceedings. This can lead to more people pursuing careers in these fields. It may be more difficult to find suitable jurors. Some prosecutors screen for people who watch crime television, which eliminates some individuals. Criminals watch these shows. They may learn new ways to cover their tracks and commit more difficult-to-solve crimes. Jurors have higher expectations for evidence. Crime television is filled with quickly-run DNA testing, toxicology reports, and impressive technology, yet most government budgets limit these resources. 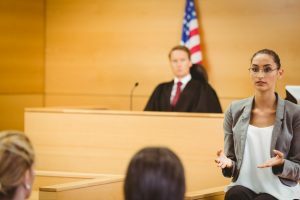 According to a study by the National Institute of Justice, 1000 jurors were surveyed prior to serving in trial, 46% of respondents expect to see some kind of scienctific evidence in every criminal case. Click to view all survey results. As a result of jurors expecting more, investigators may spend more time and resources conducting unnecessary tests just to prove they were thorough. Jurors have advanced personal technology, so they expect the same from prosecutors. It’s hard to find someone who doesn’t have a smartphone these days, let alone other technology. When jurors sit through days of verbal arguments and testimony, it just doesn’t resonate like it may have before our culture became so saturated with technology. The CSI Effect has certainly given the law community something to think about. The question is, when will the courtroom catch up with technology? To learn about one way that affordable, modern technology is used in today’s courtrooms, visit https://www.l-tron.com/oscr360.